Wipe out the monotony from any day by practicing wanton acts of cuteness. Pop Ink soap design ... making puppies happy. CSA Images has been cranking out retro-meets-modern designs for quite a while, and their Pop Ink division specializes in the sweet end of the spectrum. They play with strange animal illustrations and fuse them with practical objects like soap and wrapping paper, thus sparing us the embarrassment of owning a figurine collection. Thanks to their plates, you can have a side of nostalgic whimsy every time you serve a meal. Styles feature ’60s-era silhouettes, paper dolls and animals. The “cannibal kingdom” napkins show a demented side to their twee, frolicking animals. Their books are more syrupy. Happy Kitty Bunny Pony, subtitled “a saccharine mouthful of super cute,” explores America’s fascination with all things precious and includes plenty of turn-of-the-century and Depression-era kitties, bunnies and ponies. Pop Ink seems to capture the ridiculousness of these images, but also the joy. They respect the cute, deconstruct it and twist in one impishly deft swoop. You’ll be happy to know they have a new line of memo pads, too, which have a more sophisticated feel. 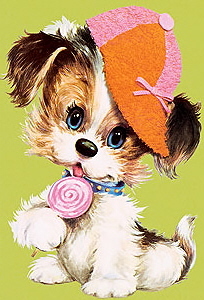 The popular blog Cute Overload is like a reality show version of Pop Ink’s sensibility. You can enjoy the photos of animals that designer Megan Frost posts each day because you think they’re seriously adorable or because you can’t quite stop yourself from looking or because you think the downfall of civilization is upon us – or you can experience all these perspectives at once. I know the cuteness seems gratuitous, but here’s my point: Find some little thing that makes you happy, and invite it into your life. The everyday mundane can lull us into forgetting we’re the ones in charge of how we feel in any given moment – and not the rude person at work or the crazy drivers on the road. These bursts of cuteness are extreme enough to disrupt the banality. If not a genie in a bottle … maybe a goddess in a tin? 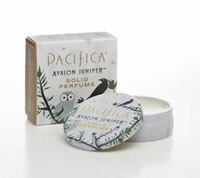 These adorable tins of solid perfume from Pacifica – known more for their exotic candles – are small enough to slip into your wallet and take anywhere. I haven’t worn perfume for years, but these have a natural, subtle scent that I find irresistible. Actually, they’re sort of like spreadable candles to-go. The sandalwood tub smells like what I imagine the first perfumes smelled like thousands of years ago when ancient cultures burned resins and woods as part of their religious ceremonies and then rubbed their bodies with the liquid. But grand imagery aside, the scent isn’t overpowering. Honestly. The Mediterranean fig scent smells as woodsy as it does fruity. The marketing folks at Pacifica point out on the back of the tin that the goddess Demeter introduced the fig to mortals as a symbol of long life … so you can see that there’s plenty of vaunted allusion to go around here. Whereas the fig scent is more for Demeter types, I’m feeling the Malibu lemon blossom tin is more for those who relate to the goddess Artemis – she’s not one to lose focus when she’s on the hunt. This one is mostly citrus-like but has a slight undertone of grassiness. Of course, I could have been swayed after I read that part about the grass on the back of the tin. Junipers for all my friends. Those are the only three tubs I’ve smelled with my very own nose, but Pacifica makes more overtly floral varieties as well. I’m tempted to try the earthy-sounding new Avalon juniper scent. The tin is a gorgeous winter-y white, and junipers are often used in magical rituals during the cold months. If you’re not used to wearing perfume, consider this: The Roman public baths were said to house shelves and shelves of fragrant oils, where Romans applied perfume several times each day (with all that bathing, I guess multiple applications were necessary). In medieval times, women wore perfume around their necks to ward off odors and plagues alike. Cleopatra had her myrrh, Marie Antoinette had her florals … really, you’re just playing your role in history. My point is, we sometimes lose sight of how entirely glorious we are. We all need a couple of daily rituals – not routines we perform mindlessly, but intentional acts that evoke the sacred. By associating a story and meaning with these perfumes (or your own), you can remember who you are just by anointing yourself in a sweeping gesture that also happens to smell nice. If you already have a favorite scent, give yourself a story about what you’re already using so that whenever you make it part of your day, the ritual remembering begins. 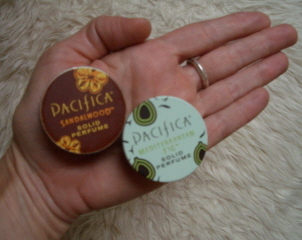 Pacifica solid perfume tins, $8.95. Also available at some Anthropologie and Whole Foods Market locations. Nine out of ten doctors agree … upbeat music makes you happy. 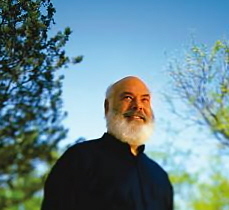 A few years ago I was reading a book by one of the early mind-body experts, Dr. Andrew Weil. I think of him as my personal Harvard-Medical-School-trained shamanic Santa Claus. Tucked somewhere in the book was a list of steps to a healthier life, and one of his recommendations was listening to upbeat world music. Hmm, I thought … since I’m allergic to penicillin, I might as well give happy music a try. This advice came at a time after my divorce when I had moved by myself to a part of the country where I knew not one person. For some reason, it didn’t occur to me that this might be difficult and isolating until I was already there. Suddenly I had hives that no doctor could stop. My apartment was temporarily overrun with cockroaches, courtesy of a neighbor who set off a bug bomb and left town. When the 17-year cicadas (aka locusts, in colloquial terms) started hatching that same week, I seriously thought the ten plagues of Moses were raining down upon my head. I was doing plenty of traditional soul-searching, but I figured a little background music couldn’t hurt. The concept makes sense anyway – we make better decisions and come to a clearer understanding when we feel at ease. A contented perspective makes us more receptive and draws in more positivity. Some say “like attracts like,” some call it “the law of attraction” and some say we reap what we sow. However you want to say it, it’s true. We generate more for ourselves of whatever vibes we’re putting out there into our spinning blue planet. The Charm-o-Matic happy formula: positive thought + positive emotion = good. A happy dance is inevitable. If only I had majored in physics instead of English, I could astound you further. So as overly simplistic as it sounds, listen to happy music. If you aren’t already into world music, the Putumayo dance albums are a great place to start. 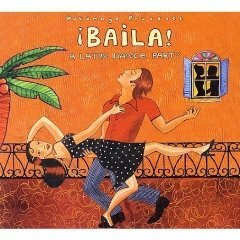 “Baila – A Latin Dance Party” is my current favorite. Or look for artists such as Amadou & Mariam, Ozomatli, Yerba Buena, Balkan Beat Box, Mexican Institute of Sound and El Gran Silencio. Free options: If your budget doesn’t have room for new music & you don’t already own some world tunes, just give your local library a try. Also, you can listen to the Putumayo World Music Hour for free online. Or subscribe to the free KCRW Top Tune podcast. It’s a fresh song every day, and while not all of the songs meet the Happy Meter on the Charm-o-Matic, plenty do. Plus, you’ll stay up with the legendary Morning Becomes Eclectic playlist. So take it from someone who had hives and cockroaches and locusts all at once and felt all alone in the cold, cruel world: Music helps. Play some in the morning when you’re getting ready. Play some in the evening when you’re doing the dishes. Play some in the afternoon when you feel like sticking a fork in your eye. Diamonds are okay, but as far as I’m concerned, a notebook is a girl’s best friend. In fact, notebooks and memo pads are the only things I collect. I think my fixation is two-fold. First, a beautiful notebook satisfies a craving for good design in an inexpensive, practical way. In fact, you can carry them around with you, which is more than I can say for ceramic owls. My favorite notebooks are invariably from Japan and France, and these lovelies are my current obsession. They’re made in Seattle by Laughing Elephant, but they look like something you could have picked up the last time you wandered around Paris. These have an unusual weight as well. I’ve never smoked, but they remind me of elegantly slim cigarettes. Not that I’ve been putting them in my mouth or anything. All the designs are reminiscent of the Art Nouveau and Art Deco movements. 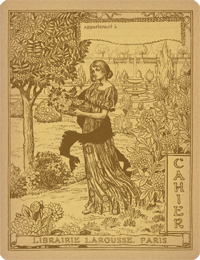 The Nouveau-looking ones have flowing, organic lines of plants and a goddess-looking woman. Since the whole idea of Art Nouveau was to bring art into everyday life, a notebook seems like the perfection expression of an ideal to me. And the Deco styles don’t just bring back the machine-age look of the 1920’s. When the movement emerged, the streamlined designs were meant to evoke geometric shapes from Aztec, Egypt and other ancient civilizations. Double the history, double the fun. Today, they look modern. And hey, they’re just four bucks each. That’s art for the charming masses. The past I talk about in Jesus Goes to Charm School led me to invent the Charm-o-Matic, a handy little metaphorical machine that generates conscious delight at the push of a button. Because happiness is an assembly line. Delight doesn’t always just happen. Some deliberate assembly is required. Because mystics-at-large can appreciate the subtle genius in lip balm and macaroons, in pine trees and flip-flops, in gnomes and notebooks. Because we all need our own little pocket guide: a compendium of delights for a fulfilling life. It’s a Ben Franklin thing. It’s an Emily Dickinson thing. Because charm is the new black, and everyone’s tickled pink. Cynicism is way too easy, and snarkiness is as been-there as its own nose in the air (except when its head is in the sand). Because bliss is interesting, and happiness is smart. Because the truth sparkles in a million different ways when poetry is on the brain. Thinking on purpose makes waves. Or makes them stand still. Because shamans, queens and warrior goddesses light sacred fires every day with a sip of morning coffee. Because the Charm-o-Matic light is always on. Life, liberty and charm-i-ness for all. So let’s set up the Charm-o-Matic and get busy. Let’s keep it somewhere handy on the counter. Let’s not be haphazard or skin-deep. Let’s be charmers. Now that I’m almost 40, I’ve found a whole new sense of happy adventure. Entirely as a coincidence, I also started blogging. Specifically, I’m blogging about my quirky religious background and the charming path I found that goes to a truer place. I started my career as an English teacher in Kentucky and Tennessee, took a break for grad school in Minnesota and then headed to San Francisco, where I unwittingly began a career in online media. 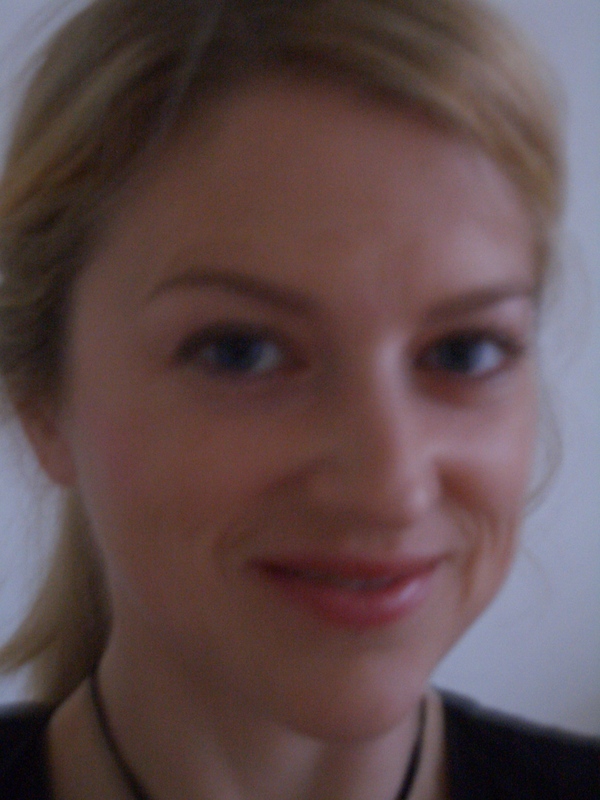 I worked for Citysearch.com for six years, ending up as the Senior Editorial Director in Los Angeles. Then I worked at AOL for two or three years in the D.C area before moving to Nashville and working for a small start-up for baby boomers until the owners shut it down about a year later. No longer working for anyone full-time, I smell flowers regularly. Roses are okay, but they’re not my favorite. My fascination with finding symbolic meaning in consumer culture began back in 1998 when I wrote three ongoing shopping columns for Citysearch – Brand Nation, Made by the Bay and Fetish Object of the Week. I’m not drawn to the kind of superficial fixes that clutter our lives with meaningless “stuff” and or to the glib obliviousness to the world’s suffering that gives happiness a bad name. I’m talking about the power of finding fresh joy in the intensely particular forms of modern life. Instead of glorifying the same old boring negativity, cynicism and fear, we choose to peer beyond into the beauty. I created a Charm-o-Matic for myself when I realized that I was responsible for my own happiness. After I experienced a religious un-conversion, I began putting all of the pieces back together to form a stronger whole – with an eye toward peace, beauty, kindness and innovation. Now, I’m putting the Charm-o-Matic where all self-respecting machines belong: online. The Charm-o-Matic generates techniques, tips and totems, all for your living pleasure. I love talking about these things, and I hope you’ll share what makes you happy too. I look forward to knowing you.